The establishment for The 16th Light Dragoon Regiment now consists of two squadrons of twelve miniatures each plus a regimental commanding officer. Total: 25. 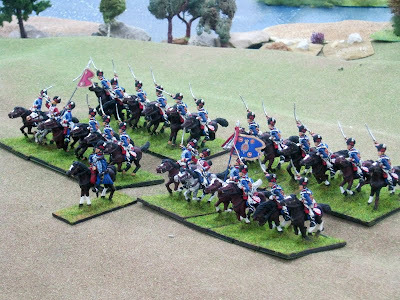 All castings are 28mm British Napoleonics from Elite Miniatures in the UK. The commanding officer is a Royal Horse Artillery officer; nice because he wears a tarleton hat like everyone else. It works. What's Next? The 15th Hussars on the same establishment. These wear busbies and have a pelisse flying off the shoulder. See previous post for some other photographs, if you please. The first game will be in early November at Hause Der Alte Fritz. Thus, I need to get cracking on the 15th Hussars!